Ref No Grave or Memorial / Rhif cyfeirnod bedd: South-West of church. John Warburton was born at Sealand in 1878, the son of Thomas & Martha Warburton. The family was at White House, Sealand Bank in 1899: Thomas 41 agricultural labourer, Martha 41, Thomas 15, John 12 born Sealand, William 11 Samuel 9. John Warburton married Margaret Griffiths (father John Jones), at Bistre, 19th March 1900. John and Margaret were living at Hewitt’s Lane in 1901. John was listed as a labourer at a colliery. Margaret Warburton of Hewitt’s Lane was buried 17th June 1903 age 24. John married Maria Griffiths at Bistre 3 February 1909 (again father is listed as John Jones). His wife is identified as Maria in both the 1911 census and the CWGC records. From the names on the marriage entries in the registers it appears that Margaret and Maria were sisters, Margaret and Maria Jones, daughters of John and Sarah Jones living on Daisy Hill in 1891. Maria was still living at home in 1901. From his service record, John had 7 children at the time of his death: Martha born 20th March 1902 Margaret 14th June 1903, Harold 12th December 1905, Hilda 16th April 1907, Reginald 30th August 1910, Frank 16th January 1912, Arthur 8th December 1914. Martha and Margaret were the children of John’s first wife, Margaret. The others were the children of Maria. In 1911 Margaret age 7 was with her grandparents John and Sarah Jones at Daisy Hill. From BMD it appears John and Margaret had another child Wilfred baptised at Bistre in 1900. John joined the 17th Battn RWF, attesting on 25th February 1915 when he was 36. He embarked Southampton 4th December 1915. He was wounded by a gunshot wound in the right thigh on 12 July 1916, transferred to Rouen, and then Netley Red Cross Hospital near Southampton on 19 July. He died 22 July suffering from gas gangrene and septicemia. At the time of his death John’s children ranged in age from 14 to 2. John Warburton was buried at Bistre Church 26th July 1916. His grave was inscribed “25415 J. Warburton Royal Welsh Fusilier 22nd July 1916 aged 37 years”, with RWF and cross symbols. Maria Warburton, resident of Council Houses Leeswood, was buried 26th March 1931 at Bistre, five days after her son Reginald. 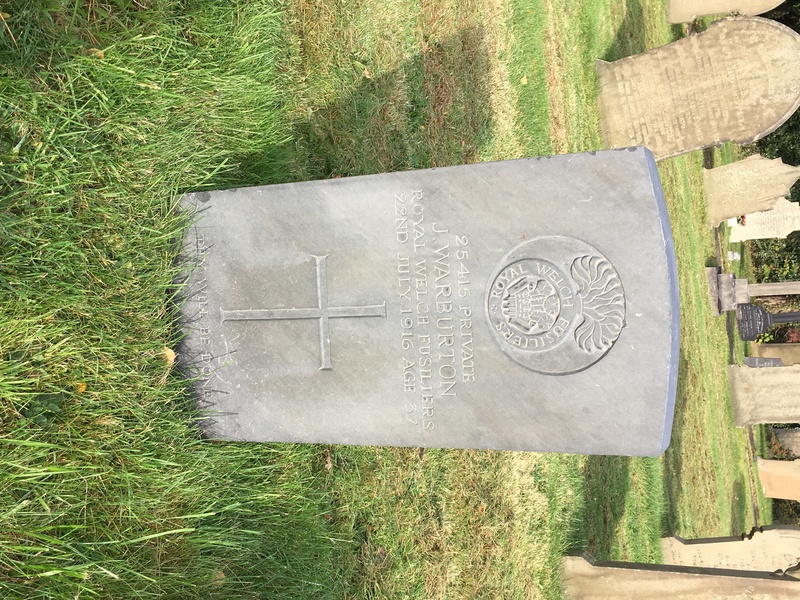 Last week, Mrs. Warburton, Mold Road, had an official telegram informing her that her husband, Private J. Warburton, was dangerously ill at the 6th General Hospital, Rouen, from gunshot wounds on the right leg. The following day a message came that he was transferred to England. Mrs. Warburton went to see him at Netley Hospital but after her return on Saturday a telegraph arrived stating that he had died. He was 38 and leaves a wife and 7 children, the oldest being only eleven. Before he enlisted he was employed as a fireman at Buckley Collieries. He was sent to France last year about Christmas. The body arrived at Padeswood on Tuesday morning from Chester. The funeral took place on Wednesday at Bistre Church, being conducted by the curate, the Rev. Sinett Richards. The choir under Mr. A. Probert sang the 39th Psalm and two hymns, “Brief Life is here our Portion” and “On the Resurrection Morning”, and the organist, Mr. W. Davies played the Dead March and “O rest in the Lord”. The choir at the gravesite sang “Abide with me”. A firing party and six bearers from the National Reserve attended, and at the close of the service at the grave the usual three volleys were fired, and the buglers sounded the “Last Post”. MILITARY FUNERAL – On Wednesday, the funeral of Private John Warburton, of the Royal Welsh Fusiliers, took place with military honours, in the Bistre Parish Church burial ground. Deceased passed away in Netley Hospital from severe wounds received in the battle of the Somme. The service, which was conducted by the Rev. S. Richards, B.A., curate, was most impressive, the hymns “On the Resurrection Morning” and “Brief life is here our portion,” were sung by the choir, and the large congregation, which had assembled at the church. “O rest in the Lord” and the “Dead March” were played on the organ by Mr. Willie Davies, A.R.C.O. At the graveside, the choir, under the conductorship of Mr. Arthur Probert, sang with fine sympathy “Abide with me.” The firing party and bearers came from Queensferry, and at the close of the service at the grave the party fired the customary salute, while the buglers sounded the “Last Post.” Private Warburton was 38 years of age, and leaves a widow and seven children, who reside in Mold-road, Buckley. With the bereaved family general sympathy is felt.